The Detroit News reports: Ford misses some buyout goals. How can Ford F this up so badly? Oh, right, they can't even do car names without Fing that up. Sigh. Bill would fine parents for leaving kids in car. Hey, here's an idea: Shoot parents who leave their kids in the cars. Or send the parents to Iraq with a stack of Bibles. Jalopnik reports: Breaking! Nissan Offers "Voluntary" Buyouts To Tennessee Hourly Workers. Heh, always followin' Ford. Kicking Tires reports: Survey Says: Buyers Slant Toward Domestics, if Any. How did Mr. T get money for a survey? We can't even get bail money! The Truth About Cars reports: Ford S-Max. Ford of Europe rocks. Ford of U.S.? Sigh. The Truth About Cars reports: Volkswagen’s US SOS. TTAC says that vee-dub better get its act together. And in a hurry! AutoWeek asks: Can this simple Dodge roadster thaw Chrysler’s sales chill? Duh. No. No small volume can do anything. If it's even made. The Detroit News reports: Gas costs back on road to $3. You didn't fall for the low fuel prices did you? Crap. Now what are you going to do with 15mpg? Take the bus? The Detroit News reports: Chrysler, GM deal would hit area hard. Oh, MSM, always looking at the negative side of things. Oh, sure, lots of folks would be canned, the housing market would circle the bowl even faster, and dealerships would probably close. On the plus side, booze sales will rise and domestic violence will be more popular than ever before. Sounds like a typical weekend at the ol' C!C!C! headquarters. The Detroit News reports: Honda settles suit over defective odometers. Ha! How friggin weak! Way to make the warranty run out faster, Honda. And who knew that 4% is the acceptable amount to be over/under according to folks who make this stuff up? The New York Times reports: A Civics Lesson With a Multiple-Choice Test. The old gray lady does a triple play testing all three versions of the Honda Civic at once. The verdict? Well, first, we need to be upfront about something. We really, really like the Civic. It's a looker of a little car, the base car gets 40 mpg on the highway, and you can get it a variety of ways (as the article states). 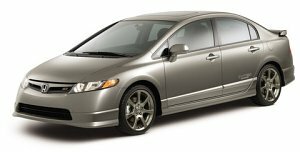 We're as pro Honda Civic as you can get without owning shares of the company. Or having one. Or driving one. Or licking one. OK, we've done one of those three things. Anyway, The NYT says to buy the regular Civic (aka not the hybrid and not the natural gas one). Why? It's just mo betta. We find it very odd that the Civic GX (natural gas dealie) does not come with navigation at all since, you know, it's hard to find natural gas filling stations and that navigation might come in handy in this particular car. Weak. By the way, that's yo'd-up Honda Civic. The regular EX is purty, too. Ford: No Buyout For You! The Detroit Free Press reports: Ford is awash in buyouts. Poor Ford. They are so totally screwed. First, they couldn't name a car (Lincoln Zephyr to MK-somethingorother). Second, they couldn't name another car (Five Hundred to Taurus). Third, they couldn't name another car (Freestyle to Taurus-X, which is just retarded). Fourth, (please not another name change, please not another name change), they offer buyouts to most everyone in the United States and all the smart workers say "Hells yes!" and so Ford renegs! Ha! Can Ford do anything right? No. Even the Edge has a friggin' rebate dealie on it. It's been for sale for, what, 18 minutes? That's a snap of the 2007 Ford Mustang GT. Why? Because we love you! The Truth About Cars leaves a steamer on the hood of the Lexus SC430: Lexus SC430 (TTAC really needs to spice up its headlines). The Japanese luxury 2+0 self-consciously straddles the line between boring and weird. Stepping inside the SC430's cabin is like lowering yourself into a bathtub. Fire up the SC430's V8 and… Hello? Testing. Is this thing on? The SC430's speed-sensitive, power-assisted rack-and-pinion steering somehow manages to get it exactly wrong. The system's too heavy when you'd expect it to be low-effort, and numb and vague when you expect it to sharpen-up. The double wishbone suspension also inverts expectations. It crashes at low speeds and floats when hustled. What's more, visibility is atrocious from inside the pillbox. Woohoo! That's the kind of anger we're striving for -- go, Justin, go! Our only beef with the review is that we consider this a fast car. It does do 0-60 in under six seconds (which Mr. Berkowitz points out) -- that's mighty fast for any kind of non-exotic car. Otherwise we agree with the review. The last time we were in the SC430's cockpit all we remember seeing was the windshield washer nozzles staring is in the face. Do you think the SC430 is bad enough to tarnish the reputation of Lexus? Is the SC430 really that bad compared to the competition? That's a snap of the 2007 Lexus SC430. And a yacht. Guess which is which? We've always wanted one, but it seems to be even better now: Maserati Quattroporte Automatica. See? Jalopnik reports: Dodge's American Muscle To Be Built In Canada. All the other Chryslers are made there, so just buy the damned thing already. You guys already have free health care. Do it! Meanwhile, GM is considering having the G8 built here if it starts to sell well. Which means it will never be built here. Jalopnik reports: Breaking! DaimlerChrysler Makes $7.3 Billion In 2006, Chrysler Group Posts Loss Of $1.5 Billion, Up To $1.3 Billion In 2007 On Restructuring. Man, you lose a billion (over and over) and all of a sudden it's "I don't love you anymore." Where'd that come from? Oh, now it's "Don't lose all the money, honey. Look, baby, that's how we roll and if you don't like it, you can just... what? Oh, baby, we'll be better. Baby, no, please baby. Dammit." Bloomberg reports: Daimler Considers Sale, Partners for Chrysler Unit. AutoWeek reports: Toyota cuts Matrix with Blade. Toyota does a little nip and tuck on the Matrix to make a Mazda3. Hey, Mazda. Remember, imitation is the sincerest form of flattery. But also remember, Toyota knows how to build the shizz, so make sure your quality is up to snuff. AutoWeek reports: New Pontiac G8 may be built in U.S. as sales rise. So if the G8 sells well (the GTO did not), maybe GM will start building it here. The Detroit Free Press reports: Toyota fears U.S. backlash over gains. If we are a free market society, Toyota should have nothing to worry about. Right? The Detroit News reports: GM adds deals after weak Jan.. There are some restrictions, but we're talking 0% financing for 60 months or $500 back. What would we look at? Probably the Saturn Aura. It be lookin' tasty. Didn't GM just have another big sale recently?